Home > Health Care, Food, Beer, Retail, Tobacco > Retail Stores and Products A - S > Lowe's Companies, Inc. 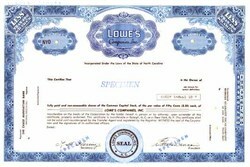 Beautifully engraved specimen certificate from the Lowe's Companies, Inc. . This historic document was printed by the Security-Columbian Banknote Company and has an ornate border around it with a vignette of the company's name. This item has the printed signatures of the company's officers. Lowe's Companies, Inc. is the world's second largest home improvement retailer. Headquartered in Wilkesboro, N.C., Lowe's is a Fortune 100 company and the 14th largest retailer in the U.S. Lowe's and its 100,000 employees are Improving Home Improvement for more than seven million do-it-yourself retail and commercial business customers each week at more than 780 stores in 42 states.